Grady’s 13 lbs. 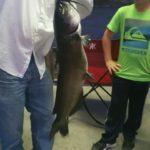 Channel Catfish gave the 10 year old a great fight. 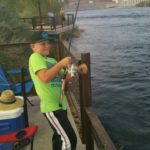 He was fishing with his Grandpa Bob and his netter, older brother Gavin. Grady was using anchovies for this catch.